Easy to Learn Korean 948 – Getting a head start. 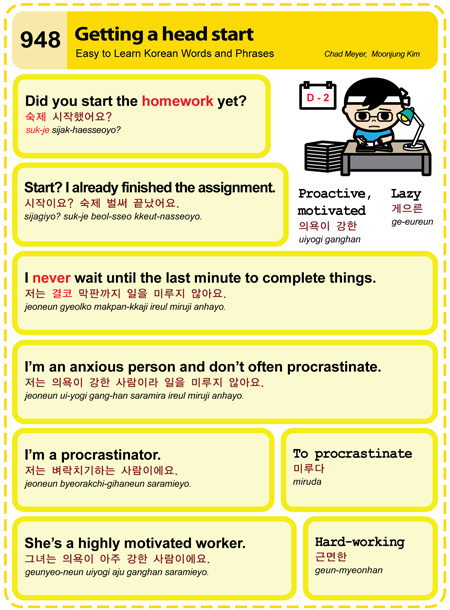 This entry was posted in Series and tagged anxious person, assignment, hard-working, head start, highly motivated, homework, last minute, lazy, motivated, proactive, procrastinate, procrastinator, 게으른, 그녀는 의욕이 아주 강한 사람이에요., 근면한, 미루다, 숙제 시작했어요?, 시작이요? 숙제 벌써 끝났어요., 의욕이 강한, 저는 결코 막판까지 일을 미루지 않아요., 저는 벼락치기하는 사람이에요., 저는 의욕이 강한 사람이라 일을 미루지 않아요. by easykorean. Bookmark the permalink.